As China’s economy turns to globalisation, at home the issue of a floating workforce is becoming more intense and complex. 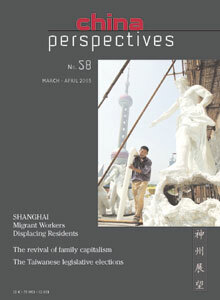 In Shanghai, low-skilled migrants are subject to economic and social segregation. This comes with a social stigma and restricts the migrants to particular economic sectors within a fragmented labour market. Nonetheless, the itineraries the migrants follow allow them to acquire certain skills and resources. Their survival strategies produce what have been called “situations of affiliation and disaffiliation�? within an overall situation of general insecurity. In 2003, the Chinese government made revitalising the northeast a priority, a clear sign that the ailing region can no longer be ignored. In the early 1990s, the region found it particularly difficult to adapt to the structural reforms and the country’s transition from a planned to a market economy. Industry and agriculture touched on crisis. Increasing numbers of officials and scholars agree that the northeast should have open, transparent and uniform rules of market operation, rather than funds, preferential policies and publicity drives. It has been proposed that the central government may consider designating the northeast an experimental region for the delegation of powers of examination and approval over such matters as investments by non-state enterprises and foreign businessmen, the starting of new projects and land-use rights. The recent renewal of Pan-Blue’s parliamentary majority⎯in an almost exact repeat of the 2001 election results⎯masks more changes than it appears both within the two camps and in the respective parties’ appeal to the electorate. Winners of the elections, the opposition parties keep losing voters. On the Green side, the defeat is mainly due to a mix of tactical errors and political factors. However, the Democratic Progressive Party’s vote share still progresses. The low turnout also shows a rise in the voter disaffection towards Taiwan’s highly partisan political debate. After the Legislative Yuan elections in December 2004, Taiwan’s political arena was, once again, echoing with recurring calls for French-style political cohabitation. Despite the similarity with the French constitutional system, the two systems differ in the gap between what is written in the Constitution in Taiwan and what is practiced. Why did cohabitation not occur in Taiwan? What has prevented cohabitation since President Chen Shui-bian’s election victory in 2000? This article sets out to analyse the above questions by comparing the ways in which Taiwan drafts its constitutional rules with those used in France. And special attention is paid to the gap between constitutional norms and principles and the application of the constitution in practice.